This week, I will be teaching for the second time at the University of Luzern. I will be teaching a course on “Sozialwissenschaftliches Arbeiten mit Twitter-Daten”. The course introduces students to the work with digital trace data in the social sciences. The course builds on a tutorial on the work with Twitter data that Pascal Jürgens and I published in 2016. Over the course, students will learn fundamental techniques of data collection preparation, and analysis with digital trace data in the social sciences. In this, we will focus on working with the microblogging-service Twitter. 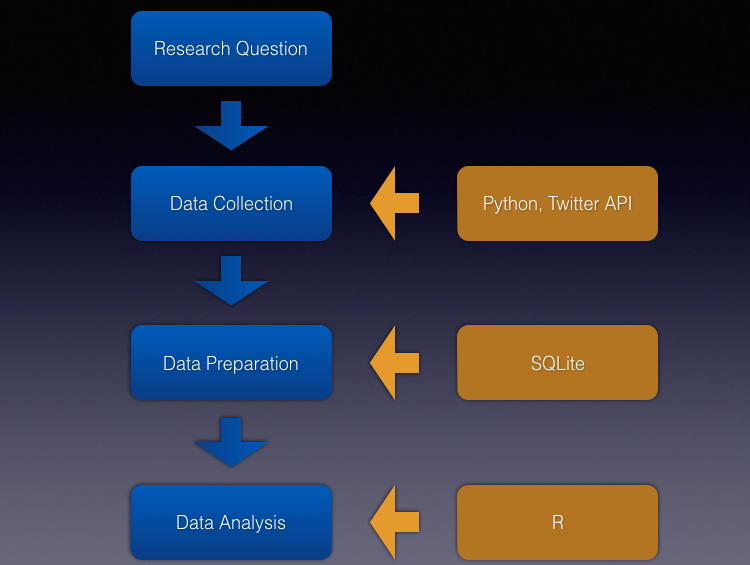 Over the course, students are expected to become proficient in the use of two programming languages, Python and R.
The course itself follows closely the outline provided in A Tutorial for Using Twitter Data in the Social Sciences: Data Collection, Preparation, and Analysis. Students will be introduced to the work with Twitter-data through a set of example scripts developed in the context of the tutorial and available on GitHub. This spring, I will the “Using Twitter Data in Social Science” course another spin. The course introduces students to the work with digital trace data in the social sciences. The course builds on a tutorial on the work with Twitter data that Pascal Jürgens and I published last year. Bradley Efron, and Trevor Hastie. Computer Age Statistical Inference: Algorithms, Evidence and Data Science. Cambridge: Cambridge University Press. Matthew Salganik. Bit by Bit: Social Research in the Digital Age. (Forthcoming). This semester, I will offer an updated version of my “Using Twitter Data in Social Science”. For the first time, I will offer the course not en bloc but instead over the course of a whole semester. This should give the participants more breathing space. The course introduces students to the work with digital trace data in the social sciences. The course builds on a tutorial on the work with Twitter data that Pascal Jürgens and I published earlier this year. Session 5: Lab: How to Find A Research Question? Currently, I am taking my “Using Twitter Data in Social Science” course on the road. This weekend and again in November, I am teaching at the University of Luzern/. The course introduces students to the work with digital trace data in the social sciences. The course builds on a tutorial on the work with Twitter data that Pascal Jürgens and I published earlier this year. Over the course, students will learn fundamental techniques of data collection preparation, and analysis with digital trace data in the social sciences. In this, we will focus on working with the microblogging-service Twitter. Over the course, students are expected to become proficient in the use of two programming languages, Python and R. The course will be offered as a Blockseminar on two weekends in October and November. Session 13: Sample Analyses: Why Count? Session 16: Where to take it from here?